Participatory Budgeting (PB) gives residents of our district the opportunity to propose, develop and vote on at least $1 million in City Council capital funds each year. Melissa was one of only four pioneering Council Members to bring this initiative to their districts in 2011, They have since been joined by Council Members David Greenfield, Steve Levin, Mark Weprin, Donovan Richards and Sara Gonzalez/District 38 candidate Carlos Menchaca. PB is made possible through the support of Community Voices Heard and the Participatory Budgeting Project. General information about PB citywide process is available at www.pbnyc.org. The process begins with the annual neighborhood assemblies — brainstorming sessions where community residents come together to identify needs in the district. Here are the dates for this cycle’s neighborhood assemblies. Please join us and also stay tuned for other ways to propose project ideas! Food and translation will be provided! The PB initiative takes place in three stages, including a series of community meetings in each district, a process for finalizing proposals and a final public vote. 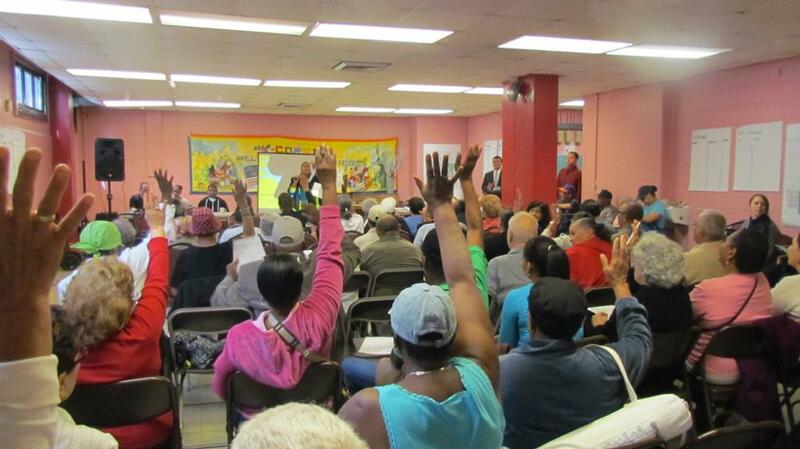 Throughout the month of October, we held a series of neighborhood assemblies, where the brainstorming process began. At these assemblies, all residents of District 8, as well as those who work and go to school in our district, were invited to help formulate some of the ideas generated in these assemblies into concrete proposals. After a set of Project Expos in February and March, there will be a vote in April, open to all residents of District 8 over the age of 16. Voting happened between Monday, April 1st and Sunday, April 7th. Below are the winning projects, which total $1.9 million. Voting happened between Sunday, March 25th and Saturday, March 31st. Below are the winning projects, which total $1.54 million. If you are interested in taking part or have any questions or suggestions, email us at mmvbudget@gmail.com. I am writing on behalf of Park East High School and the East Harlem Pride sports program. We desperately need improved access to Randall’s Island in the form of a shuttle bus that stops on 106th and 3rd going up and across the RFK bridge to Randall’s. Park East High School is in need of locker rooms for our students to change for physical education class. Our community is plagued by obesity and high rates of asthma so sports and recreation are a must, not a luxury! Active kids do better in school too. Thanks for all your support past, present, and future! the apartment and then moves in. rug elevator and/or lobby. They act respectful. the ‘bad-guys’ think they got away with it. are using their cellular phones instead of home base telephones. and beautiful floors), notice how different people behave and act. new motors? When it rains, they must put rugs to dry the floors. due to the grease that really destroys the wall. to lack of proper wall. look horrible and it is also unsanitary. the Volunteer Office? We all should have the same treatment/floors. item fall under sanitary issues. invitation. Again, my apologies for not attending. respect to keep up with it due to the fact this is where we live. You can reach be at (212) 996-5273. Thank you. Thank you for inviting me to the above-mentioned Meeting. At Park East High School we need 4 SmartBoards for our math classrooms. Our math teachers are interested in using this latest technology to further student learning. Specifically we are interested in using “clicker” technology to better assess how well students have learned very specific things in class. When each child can signal the teacher (click) in real time, the teacher can better adjust teaching to meet student need immediately. We hope this is an idea that the community can get behind and support the young people in the neighborhood. I actually really want to bookmark this particular posting, “Participatory Budgeting | Melissa Mark-Viverito” on my personal web site.